Do you know a student who specializes in procrastination, struggles with time management, and has difficulty getting assignments completed efficiently and turned in on time? Here are six basic strategies to ease the burden of homework. Getting started is tough. Set up all your materials in advance. Set a timer and begin by working for ten minutes. Then take a break. Then start homework with focus, avoiding TV, texting, bothersome family members, and other distractions. Schedule a short "distraction break" every half hour to reward productivity or take short breaks in between assignments. Use a system to keep track of assignments, such as a physical planner or online calendar. Keep a jar of pencils/pens/highlighters, paper and a calculator handy. Use a large calendar as a placement on your table or desk to keep track of long-term assignments. Allot time on the calendar to work on long-term assignments and study for tests, thus avoiding cramming. Schedule homework and study time for a set period each day, taking extra-curricular activities into account. Schedule time for parents to quiz students on vocabulary and quiz/test review. Practice active study strategies, such as creating and completing study guides, rather than passive habits like reading through the material. Increase productivity by having a healthy snack and putting on comfortable clothes. Avoid snacks and drinks with excessive sugar, including fruit juice, with the exception of fresh fruit. Do homework in a comfortable place. The couch is OK as long as there are no distractions. Exercise before starting homework. Stretch and take walks in between assignments. Research shows that exercise helps with focus by increasing levels of dopamine and epinephrine in the brain. Does this list seem overwhelming? Work with your child to try one of these strategies each day. Just as breaking down tasks into chunks makes them more achievable, trying new strategies one at a time is most manageable.. Then tweak them to make them your own. FYI, Tutoring For Success offers Academic Coaching to help students with motivation, time management, organization, and efficient studying strategies. Are you one of those people who is always late? Is your child often late for school or extra-curricular activities? Are you stressed about being late, especially for important events like movies, weddings, and flights? If so, you are not alone. No matter how much we try, some of us consistently struggle with being on time, while those who are always on time seem to do so effortlessly. Here are some techniques to help you change your habit, reduce stress, and gain more control over your life. 1. Make being on time a priority, not an afterthought. People who are punctual think it is important and necessary. 2.Have an appointment? Set an alarm for when it is time to get ready, not time to go. When the alarm rings, you need to stop what you are doing. 3.Preparation is important. When you need to leave for an appointment, for most people it will take at least ten minutes to go to the bathroom, get your stuff together, and possibly take out the dogs. 4. Is the phone ringing or a text coming in when you are getting ready to leave? Unless it is urgent, let it wait. 5. Chronically late for school? Set the alarm earlier and try to eliminate morning distractions. 6. After all of this, add an extra 15 minutes. There may be traffic or you make miss a turn. 7. Try to be early. Think of how great it will be to be calm and relaxed, have time to take a few deep breaths, take a minute to check your phone, and congratulate yourself for training yourself to be punctual. 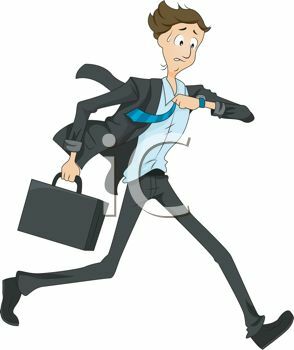 While it's true that some people run naturally late, anyone can still learn how to get places on time. Look at the point of view of the teacher, who is distracted by students walking in late, and the friend who always has to wait for you. By making punctuality a priority, you are telling people that you respect them and their time. Stressful as they may be, standardized tests are an important part of the college application process. Therefore, if you are an aspiring applicant, you have probably already begun pondering whether to take the SAT or the ACT. Both tests are accepted equivalently by universities, so there is no outright advantage. You understandably want to achieve the best score percentile possible, so you have probably already contemplated the following irresistible question: which test is easier? However, such a question cannot be determined objectively. Instead, you should be asking yourself the following question: which test will be easier for me? In order to best answer this question, it is first important to first summarize the key differences between the two tests. Now, let’s unpack all that. 1. The SAT has a no calculator math section and the ACT has a science section. Therefore, if you are slow and often make errors when attempting mental math/simple calculations, the no calculator math section on the SAT might be an issue. On the other hand, the ACT’s science section requires the quick interpretation and analysis of graphs, figures, tables, and passages related to various scientific concepts, most of which you will have little background in. If this task proves to be particularly difficult for you, the ACT science section might bring down your score. The fact that the SAT and ACT have these two different sections is significant and could reasonably affect your choice of standardized test. 2. The SAT has grid-in free response questions on the math sections while the ACT has none. Hence, if you tend to get away with estimating on multiple choice math sections, this aspect of the SAT might cause some trouble. Grid-ins can be especially stressful when you are running out of time because you cannot resort to making educated guesses. Ideally though, you should get to the point where exactness is the goal rather than estimations. The stress of grid-in questions is definitely possible to overcome with practice, and therefore, this difference should not be a defining consideration for most test takers. 3. The math sections of both tests differ in content and straightforwardness. Both cover mostly algebra, but the ACT also covers substantial amounts of geometry and trigonometry. Therefore, if you struggle with geometry or have not yet taken a class in trigonometry, the ACT math section might be quite difficult. Although the SAT math section covers mostly algebra, its questions are often long and tricky, while ACT math questions tend to be more straightforward. Along with pure math, SAT math questions also involve a significant amount of reading comprehension and critical thinking. This task can be difficult for some students, even if they are proficient in algebra. Evidently, the difference in math content between the two tests has the potential to greatly affect your overall test percentile. 4. The SAT provides a math formula sheet, while the ACT does not. However, the formulas provided are mostly geometry formulas, and the SAT incorporates little geometry. Furthermore, these formulas can simply be memorized for the ACT. As you can see, this difference should not have a huge impact on which test you choose. 5. On the SAT, math accounts for half of your total score. Meanwhile, math only accounts for one-fourth of your total score on the ACT. Therefore, if you consistency struggle with both SAT and ACT math, you will likely achieve a higher overall ACT percentile. On the other hand, if math is your strong suit, you will likely achieve a higher SAT percentile. However, it is important to remember that the ACT has a science section in place of the SAT’s no calculator math section, so consider if it is more beneficial for you to have an extra math section or a science section. This difference in scoring can be consequential if you have a significant difference in ability between the math and science sections. 6. The ACT allows less time per question than the SAT. This characteristic can make the ACT problematic if you are a slow test taker, because you might not finish some of the sections. Consistently slow test takers might have a better chance on the SAT, where they are more likely to finish all of the questions. This difference in time allowance is very important to consider, since not finishing several sections could substantially lower your score. 7. There are a handful of questions in the SAT reading section that require you to select which quote from the passage best supports your answer to the previous question. Such questions can be frustrating, because if your answer to the previous question is wrong, your evidence selection will likely also be wrong. However, some students also report that such evidence-based question pairs force them to properly consider the merit of their previous answers. Students tend to have mixed opinions about these question pairs, but since such questions are limited in number, they should not be a defining consideration in which standardized test you choose. 8. The SAT and ACT optional essay prompts differ greatly. The SAT essay requires you to analyze how an argument is developed in a provided writing piece. This task is very similar to that of the rhetorical analysis essay required in the AP Language and Composition Exam; therefore, students who are taking/ have taken this course might benefit from their familiarity with analyzing arguments. The ACT essay, on the other hand, requires you to develop an argument on a given topic while examining the merit of several provided opinions. Your preference for analyzing the development of an argument or developing your own argument will determine which essay is best for you. However, most universities do not put a lot of weight on SAT and ACT essay scores, if they require them at all. Therefore, although this difference seems substantial, it should not usually be a huge deciding point. As you can see, the SAT and ACT have a number of differences, some of which are more significant than others, and all of which need to be analyzed in the context of your particular skill set. Practicing each test is very important, because you might be surprised to discover that your strengths and weaknesses are different than you originally thought. Additionally, recognize that apparent weaknesses can always be improved upon, and can eventually even become strengths. You should pick your preferred standardized test with care, but know that you can always switch if things do not work out. And remember, standardized tests are just one piece of the grand puzzle that is your college application. Do not lose track of the other parts of your story. Be thorough in your essays and activities, the elements of your application that convey who you are. Just try your hardest on your standardized tests, because when it comes down to it, that’s all you can really do. Bethany is a current University of Chicago student who has experience tutoring both SAT and ACT prep. She took both tests three times and hopes to communicate to current college applicants what she wishes she had known beforehand.